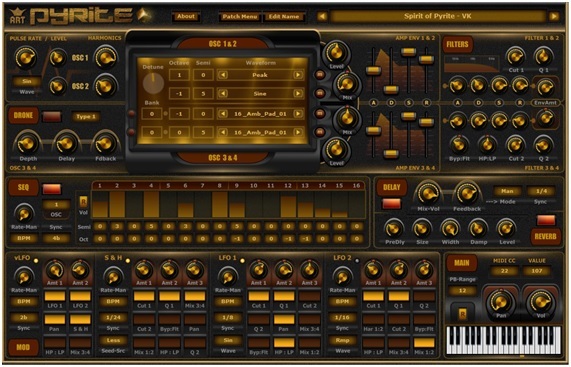 Art-Pyrite is an atmospheric synthesizer available for Windows platforms, created by Artvera Music. The synth is designed to provide soundscapes, pads, textures, sound effects and sequences, ideal for soundtrack, new age and ambient music. It’s possible to combine up to four sound sources using both analog and PCM oscillators to build interesting and exotic sounds. 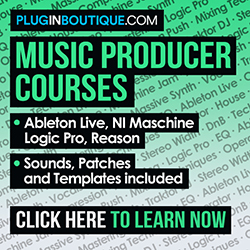 Filter, envelope and LFO sections are present, as well as a built-in step sequencer, delay and reverb effects. At the top panel, it’s possible to load and save sound banks and presets and edit a preset name. Below it there’s the sound source section. The analog oscillators are at the top left. There are controls for Pulse Rate, Waveform selection, OSC 1 and 2 levels and harmonics amount. It’s possible to choose between 22 available waveforms. In the display there are Octave and Semi controls for all sound sources. The Waveform column allows the user to set the desired analog or PCM waveform. The synth comes with 256 available sounds that can be used as PCM oscillators. It’s possible to load external SF2 files to use as PCM waveforms. A Drone section at the bottom left, with Depth, Delay and Feedback buttons, will affect both PCM oscillators (OSC 3 and 4). There are two amplitude envelope sections, with ADSR faders. The upper section will affect oscillators 1 and 2, while the lower section will affect oscillators 3 and 4. At the left, the Filters section shows separate ADSR controls for analog and PCM waveforms. Each Filter module also has Cutoff (Cut) and Resonance (Q) knobs. Art-Pyrite has a built-in 16-step sequencer, with available step Volume, Octave and Semitone controls to create interesting rhythm patterns. The OSC box allows the user to choose which sound sources will be affected. LFO 1 and 2 sections come with three slots each, with an amount knob (Amt 1, 2 and 3) that can set the amount of modulation affecting up to three destinations at the same time. LFO 1 and 2 also have Sync and Wave selectors, as well as a Rate-Man knob. Art-Pyrite comes with a similar LFO section, the S&H (Sample and Hold) generator. However, it works as a random modulation type, which can result in surprising new sounds. The synth has an Effects section, with Global Delay and Reverb. The Main section has controls for Pan, Volume, Pitch bend range and also a virtual keyboard. Midi learn feature is also available: right-click a knob, button or fader and then set it to your preferred midi controller. – SF2 files as PCM waveforms. You can download a demo version of Art-Pyrite before purchasing.